It’s a Thursday morning, and Omar Leyva is marking a chalk line along the base of a half-built Craftsman-style bungalow. Up the slope behind him looms Pasadena’s Spanish Revival U.S. Court of Appeals building. In the other direction, the 1913 Colorado Street Bridge arcs across the Arroyo Seco, less than a mile from the Rose Bowl. The 39-year-old family assistance specialist with the National Guard shares a one-bedroom apartment nearby with his wife and two daughters. “We all sleep in one room,” he says, but at $1,650 a month, it’s all he can afford. Which is why he’s here today with volunteers from Compton YouthBuild and the LA Conservation Corps: to help build his family a new home. The project belongs to the San Gabriel Valley Habitat for Humanity, and when finished next summer, its nine bungalows—each about 1,300 square feet with three bedrooms and two bathrooms—will surround a common lawn, their detached garages behind them. Forming the perimeter of the five-acre plot will be a city park that fans out at the entrance to the lot, beneath the bridge’s soaring buttresses. That the residences are being constructed at all in a historic neighborhood where homes fetch more than a million dollars is noteworthy; that they’re low-income housing is kind of remarkable. In the early 1900s, the courthouse didn’t exist; the building housed a hotel, and the land below became part of its grounds. By the middle of the century, the tract was home of the Desiderio Army Reserve Center, which closed in 2010. In fact, Leyva trained there with the National Guard in 2003 before going to Iraq. After years of negotiations, plans moved ahead to combine a public park with affordable housing. But these aren’t rental units. 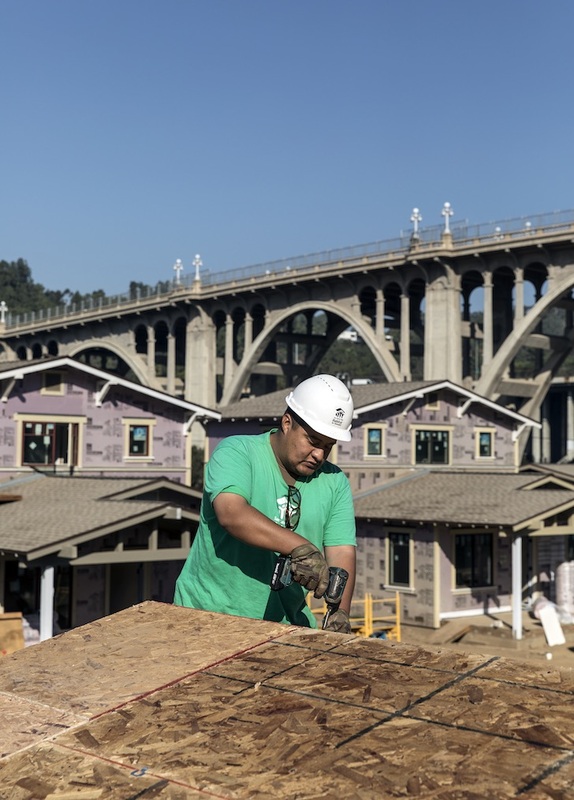 “We’ve always felt that home ownership is a key to a family’s growth and success that renting doesn’t provide,” says Mark Van Lue, the executive director of the San Gabriel Valley Habitat for Humanity. “It provides investment in the community that renters don’t tend to have.” The homes are sold at cost with zero-interest loans; calculations are made so that families won’t spend more than 30 percent of their income on the mortgage and related costs. 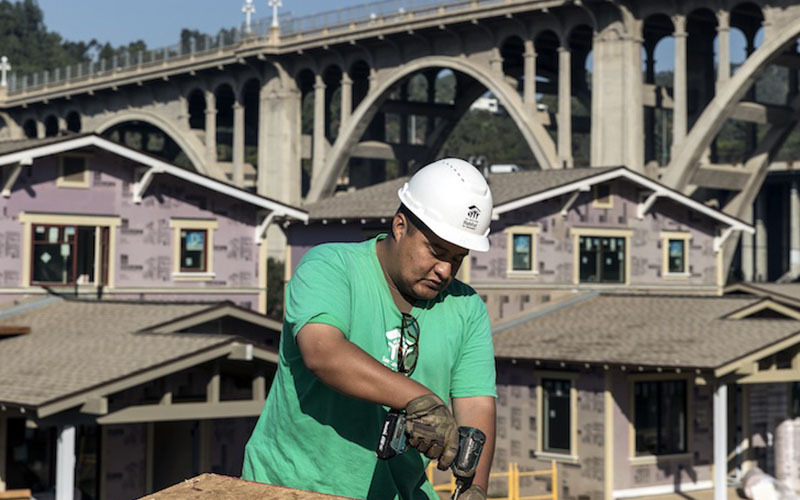 To qualify, buyers can’t earn more than 80 percent of the area’s median income and must devote 500 hours to the project, including taking life skills classes and pitching in as Leyva is today. Not that he had any construction experience when he signed on. “This is all new to me,” he says as a guy rolls out tar paper on the roof above him. “The most I’d ever done was hang a picture frame.” Leyva grew up in South L.A. in the ’80s and ’90s. “It was tough,” he says. “I had friends that even at a young age were getting shot at.” Despite being squeezed by low wages and exorbitant real estate prices, Leyva was determined never to move back. 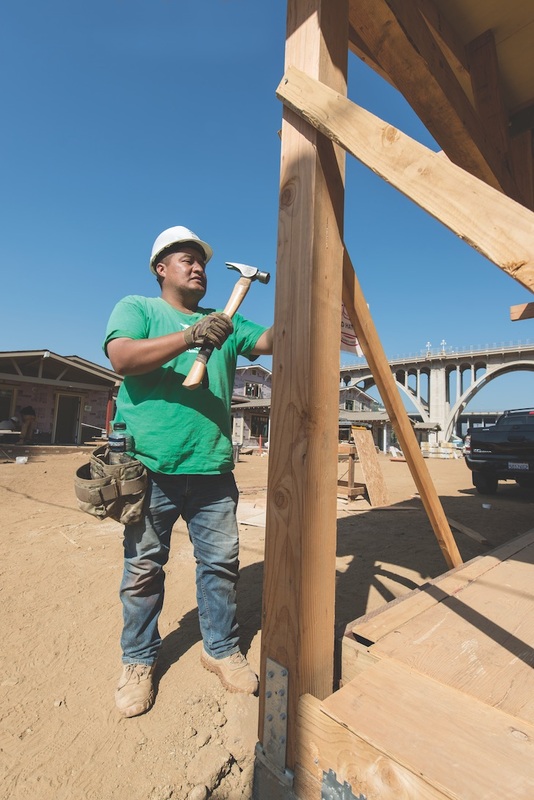 His will be one of 79 homes Habitat has built in the San Gabriel Valley since 1992. It’s a noble achievement, but Van Lue is a realist. “We’re not making enough of a dent yet to move the needle on the affordable housing needs,” he says. “We have to do some things different going forward.” Among other ideas the group will be exploring are partnerships with for-profit developers. But for Leyva and others who’ve been lucky enough to qualify for a home, the effects of the program are already incalculable. We Need to Know: What’s It Like to Live in an Apartment at the Americana at Brand?